AUTOGRAPHED BY MARK HAMILL "LUKE SKYWALKER". For Thousands of Vintage Movie Posters. We sell more vintage original STAR WARS posters than anyone in the galaxy! To view our entire STAR WARS inventory. If it has any minor defects like pin holes, creases, etc. And they are not mentioned above, they should be visible in the high resolution photo. WE DO NOT SELL REPRODUCTIONS OF ANY KIND. Perfect for a high end home theater. Highly sought after by movie poster collectors and aficionados. Get notified of our AUCTIONS & NEW INVENTORY instantly! ORIGINAL MOVIE POSTER issued by the studio when the film was in pre production. This is a vintage original poster from our archives. AUTOGRAPHED BY MARK HAMILL ON THE LEG OF LUKE SKYWALKER. "TO CHARLIE AND MYRA BEST OF LUCK MARK HAMILL". For the ultimate STAR WARS fan, this is the holy grail. 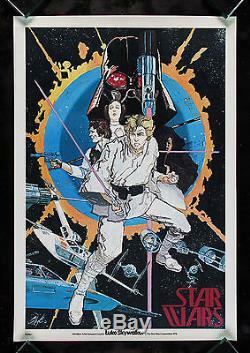 This is the FIRST poster ever issued for STAR WARS. It is NOT a poster that was issued to theat er s.
Designed by Howard Chaykin, this poster was issued in 1976 well before the movie was released in May 1977. Extremely rare and highly sought after, these very rarely are offered for sale. Most probably did not survive because at the time no one knew what a phenomenon Star Wars would become. THERE ARE BOOTLEGS/REPRODUCTIONS OF THIS POSTER! These can be very difficult to find in any condition! A long time can go by without one of these coming up for sale. You will have trouble finding a nicer one. This poster has a few minor imperfections. Folded one inch from the top. Please examine our extra large images very carefully! These detailed photos generally speak for themselves. It is a REAL ORIGINAL MOVIE POSTER issued by the studio before the film was released and meant for promotional distribution. We are absolutely certain it is authentic. You may be willing to take the risk to save a few dollars, but we are not. Minor flaw on an otherwise unused poster. C8 Excellent - Investment quality. Pin holes, small tears, etc. C7 Very Good to Excellent - Fine. Still a very nicely preserved item. C6 Very Good - The typical used poster in average condition. C5 Good to Very Good - A heavily-worn item. C4 Good - Below average but still suitable for display. C3 Fair - Heavily worn, but yet still complete. Please check with your postal system on their procedure for packages from overseas so you are not unpleasantly surprised. You must notify us before sending it back. This is extremely rare, but it does occasionally happen. We know how to create a listing that will provide you with the highest dollar possible. We can yield for you MUCH MORE than you would get if you auctioned them yourself up to TEN TIMES or more! Let us sell your posters for you! For more information about CineMasterpieces please see. We guarantee that all posters we sell are graded and described accurately. Unless otherwise specified in the description, ALL POSTERS ARE ORIGINAL MOVIE POSTERS original theatrical movie posters that were displayed or meant for display (unused) in theaters at the time the movies were released. We will put in writing that we guarantee it to be an Original Movie Poster. The item "STAR WARS CineMasterpieces CHAYKIN POSTER #1 RARE SIGNED ORIGINAL MOVIE POSTER" is in sale since Monday, November 25, 2013. This item is in the category "Entertainment Memorabilia\Movie Memorabilia\Posters\Originals-United States\1970-79".